White Mountain was the second race of out the past three where the Richard Moody Racing team finished second. Rowe’s teammate Travis Khiel was the runner-up earlier this month at Oxford. PASS North officials penalized Cassius Clark 120 points and all of his winnings after his engine did not pass technical inspection after the Thompson race. 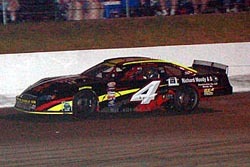 Two days after the event, Clark spoke about it with Speed51.com. Clark is still confused as to all of the options available to teams. Winning isn’t everything. According to three-time PASS North champion Ben Rowe, to win a race at all costs just isn’t worth it. So at White Mountain, Rowe was happy with a runner-up finish after he exhausted his chances of beating winner Scott Chubbuck cleanly. Wilson hit so hard that he doesn’t even know what caused the crash. According to Clark, a chain of events that started with an engine failure in the race before at Oxford missed with a myriad of engine/weight rules led to the situation. “We had to build a motor and two days before the race, my father called [PASS Technical Director] Paul Johnson and asked if we could run a two-barrel with 14:1 heads because that we all that we had and still run at 2,700 plus 50 [pounds] and 56% left [side weight] and he said absolutely,” said Clark. “We got there and ran the two-barrel. After the race, he told us that we had to be 11-1. My checked out at 12.7-1. The RMR team had a busy day between the races at Thompson and White Mountain. They had two racecars to fix in a very short amount of time. Alan Wilson might have had the only car at White Mountain capable of beating Scott Chubbuck for the victory. Wilson’s #53 was plenty quick, but hit the wall hard on lap 119. Wilson was okay, but his car was done for the night. Rowe did this despite bouncing his #24 off the wall midway through the event. Before that, Rowe was trying to run a conservative race. Curtis Gerry turned some heads earlier this month when the PASS North tour visited Oxford. The former Beech Ridge regular finished a solid ninth against a very strong field. In fact, former PASS champion Johnny Clark praised Gerry after the race even though he had no idea who the driver of the #7 car was. Well, PASS observers are now starting to learn who Gerry is. He finished in the top 10 again at White Mountain. This time, Gerry topped his Oxford result by ending up ninth at the checkered flag and it wasn’t an easy trip to get there. “This is our third PASS race,” said Gerry. ”The car was really tight. When we showed up and had two broken rocker arms. We went out for the first practice and only had six cylinders, so I came in. We didn’t have much practice time and in the heat race, we finished second but a bolt came out of the center peg of the rear end. It spit it right out through the top. We had to split the hub right here in the pits, take it apart and get a bolt. Then we had to clean it out and plug the holes. We took a rubber valve stem and put it in from the inside out and it held. Gerry enjoys racing with the PASS competitors and has plans to do a few more events coming up. Mike Rowe is second in PASS North points and leads the PASS South standings thanks to two wins down there, but believe it or not, his third-place finish at White Mountain was the first time in PASS North this season when he had taken home a podium finish. Alan Wilson walks away from his wounded #53. After Oxford, Clark said that he thought that his team figured something out in the chassis department to help them turn the corner to better finishes. But after White Mountain, he isn’t so sure it is working. Another driver struggling in 2006, at least by his own standards, is Johnny Clark. 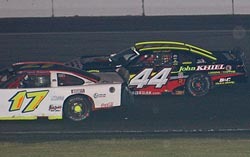 The driver of the #54 finished right behind Rowe in fourth at White Mountain and sits third in the standings, but 2006 just has not brought the type of strong runs that he is used to having. That’s what Alan Tardiff is going through this year. The former Beech Ridge hotshoe finished 12th at White Mountain with his family-owned team. conventional Oxford 250 set-up. We haven’t touched that in a few years. “The soft set-ups are what everyone is going to. It seems like you have to hit it perfectly though to be right. We don’t have pit stops to adjust the car or do this and that. Only a few cars will hit it in a race. With the conventional set-up, we seemed to hit it week in and week out. If a former champion can struggle with set-ups in the ultra-competitive world of Super Late Models, just imagine what it can be like for a rookie driver with a rookie team. Above all else, the young racer left the track with a big smile on his face. Just sneaking into the top 10 at the end of the event, was Corey Williams. The PASS regular overcame getting spun, and having a racecar that was a little off in the handling department. “It was great experience,” said Ramstrom. “Those guys are wonderful racers. I knew we had a good car but at the end the car started getting a little loose. We came off the turn sideways most of the time. In long runs I could keep up with those guys and even pass some of them. Ramstrom spun late in the race, but that had little impact on his finish. “I think I had too much speedy-dry on my tires and when I got on the gas it just came around. We caught the caution at the right time. That was awesome. Despite the fact that White Mountain is only a quarter mile in length, Dearborn thought that the amount of contact during the race was minimal. For awhile, 15-year-old Derek Ramstrom was right up there in the top 10 at White Mountain. He got shuffled back to finish 13th, but the race was still a good one for the PASS Outlaw regular. With their finish, Chubbuck took over the PASS North point lead. Since this barnstorming team races where the big shows are and doesn’t follow a schedule of points chasing, they could care less about that. But Chubbuck is enjoying the team’s string of strong finishes in the first four PASS North events of the year. White Mountain has never been one of Williams’ best track on the schedule. 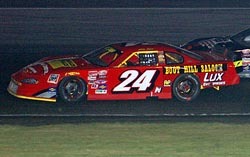 Leading into White Mountain, there had only been one PASS North race all season long when Cassius Clark did not cross the finish line as the winner. But White Mountain would not prove to be one of Clark’s fonder memories of the year. His #8 car developed a mechanical problem under the hood and Clark did not make it the to finish. With two engine failures in the last three races, Clark isn’t sure if his team will make it to the tour’s next event or take a race off. Hersey enjoys racing with PASS and knows that each time out with the tour makes his own team better and better. Khiel’s car not only wasn’t on the racetrack when the Thompson race started. It wasn’t even at the racetrack. 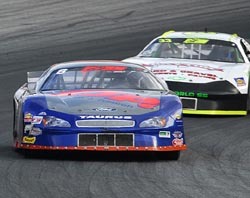 With the NASCAR Nextel Cup Series racing at New Hampshire last weekend, many tracks took the weekend off. Monadnock Outlaw Pro regular Russ Hersey and his team didn’t want to take the weekend off. So even though their track was closed, Hersey came and joined the PASS North contingent – and finished seventh. Khiel's #44 runs to the outside of Travis Benjamin's #17. Ramstrom's #35 goes for a slide through the infield. Learning to dial in a fast racecar isn’t easy in tour racing – especially with an empty book of notes. Still, the young driver isn’t at all discouraged. He’s just going to keep working on getting better. Do we sense a common theme here yet? Add Richie Dearborn to the list of drivers who were a little bit off with their race set-up. He finished sixth, but would have liked to have been just a bit better. Travis Benjamin ran as high as second at White Mountain, but dropped out of the race with mechanical problems. Before that, getting caught behind a lapped car proved to be challenging. Travis Khiel wrecked during a heat race at Thompson and didn’t even get to start the feature event. With only one car and one day before White Mountain, his Richard Moody Racing team got to work and were rewarded with a fifth at White Mountain. 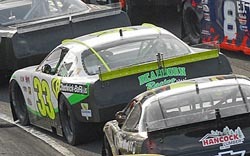 Dearborn runs his #33 in traffic. 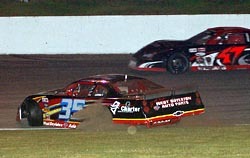 Russ Hersey's #88 tries the high side on Derek Ramstrom's #35.